Art on Kingsway has been going for over two years and only recently begun showcasing a new artist each month. The pop up Art Gallery is Art on Kingsway in Amanzimtoti. 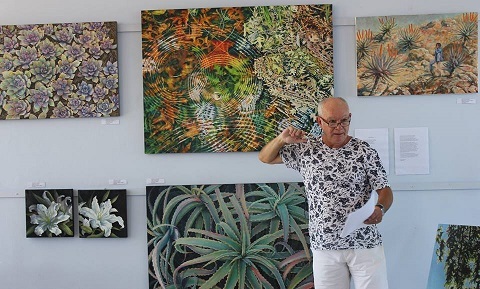 In the past, in addition to the artworks of the local artists, the works of the Fibreworkx Artists of KZN have featured, as have the landscape photographs of local veterinarian, Eugene van Heerden. The launch was held on February 2, where McMurtry held a walkabout. It was attended by an interested crowd of artists and friends who enjoyed his amiable and informative address. The immediate appeal of his work was demonstrated in the sale of eight of his paintings within the first hour of the event. The organisers anticipate a very successful month! “Taken from Waiting for Godot, McMurtry uses the theme of ‘The light gleams. . . .’ to capture the moment when objects or people are at their shining best, and yet contained within that moment of perfection there is inherent death and decay. This theme is particularly well realised in his portraits of three of the actors who play characters in the award-winning musical Camelot for which McMurtry was assistant director. Each of them momentarily holds the light of humanity within them before it fades,” adds Pratt. Art on Kingsway is up a short flight of stairs at Toti Oasis, a Caltex Garage in Kingsway (Andrew Zondo) Road. Travel south on the N2. Take the glide off to the left when Galleria is on your right, and choose the R102 fork in the road. Travel about 2 kms south and you will find it on your left. There is parking and good coffee downstairs.